Summary: Salesforce’s Marc Benioff continued his now-epic stream of social business thought leadership at this week’s Dreamforce 2011 in San Francisco. The messaging was certainly world class and the slew of announcements this week will address many of the shortcomings or feature gaps in its social software product line. But is a company whose roots are in sales automation and cloud-based SaaS the right firm to take organizations fully into the social world of the 21st century? As of today it’s clear Salesforce is squarely in the midst of a major reinvention as a pioneer for 21st century business.Yesterday at Dreamforce 2011 the attendees, as well as the world at large, were given one of the most dramatic and far-reaching messages about the future of business I’ve seen in the half decade that I’ve been involved in enterprise social computing. Salesforce CEO Marc Benioff regaled the audience with tale after tale of organizations changing the way they engage with their employees and customers, interspersed with major product announcements that were in no small way reminiscent of Apple and Steve Jobs. That there was a considerable amount of very slick marketing and social business Kool-aid dispensed here in San Francisco’s Moscone Center there is little doubt. Yet the earnestness, breadth, and depth of the presentation by Benioff and his erstwhile compatriots, both Salesforce executives and customers alike, were nevertheless indisputably compelling, even to those who are relatively jaded by the endless social media hype cycle. For those that want the full details, I live blogged many of the seemingly endless array of products, stories, and vision statements that were conveyed yesterday. The next day, looking over the whole pomp and ceremony that took place, it seems to me that there was indeed a very good and highly effective message about the way many organizations will evolve in the 21st century. However, I’m not quite sure that Salesforce has fully connected their products to it. At least not yet, not in their present form. But they are heading in the right direction faster and more thoroughly than just about anyone else except IBM or perhaps Jive. I spent time last night and this morning trying to reconcile the enormous social enterprise vision that Benioff is communicating with the realities of what is their increasingly powerful and extensively integrated social business platform. In the final analysis, it appears clearly designed for what the market will almost certainly need in several years, but perhaps many are still not fully ready for. Recognizing this, ZDNet’s Editor-in-Chief Larry Dignan raised some concerns yesterdayabout the readiness of organizations to make the major steps that social business transformation entails, as well as the maturity of the technology for the full scope of what Salesforce is proposing. But Benioff is clearly playing for keeps as well as for the long term. There is perhaps no one in the industry presently who is conducting both the detailed external research about what large companies are doing with social business while feeding that knowledge into the product development of an increasingly sophisticated and extensive social business platform. He was very clear that the lessons learned and best practices they’ve collected have been injected into the new products that were announced, including customer and product social networks, Social CRM, social marketing, and more. Also in attendance were the president of Verizon Business, the CEO of Burberry, the CIO of Facebook, and a dozen other significant business figures either in person or on video on stage conveying their recent experiences with social business. At the same time, as real customer stories and social enterprise vision was dispensed, it was usually prefixed with matching product announcements that moved their primary social platform, Chatter, from a me-too product into essentially a top industry contender. Before yesterday, I would have said Salesforce has useful social products and very good vision but the gap between vision and execution was still too large for most organizations to commit to. But as of today it’s clear they are squarely in the midst of a major reinvention as a pioneer for 21st century business. As presented yesterday, this transition is going well while they continue to not only extend the vision but to accelerate the product development process so that the aforementioned gap actually appears to be closing. Sounds good, right? 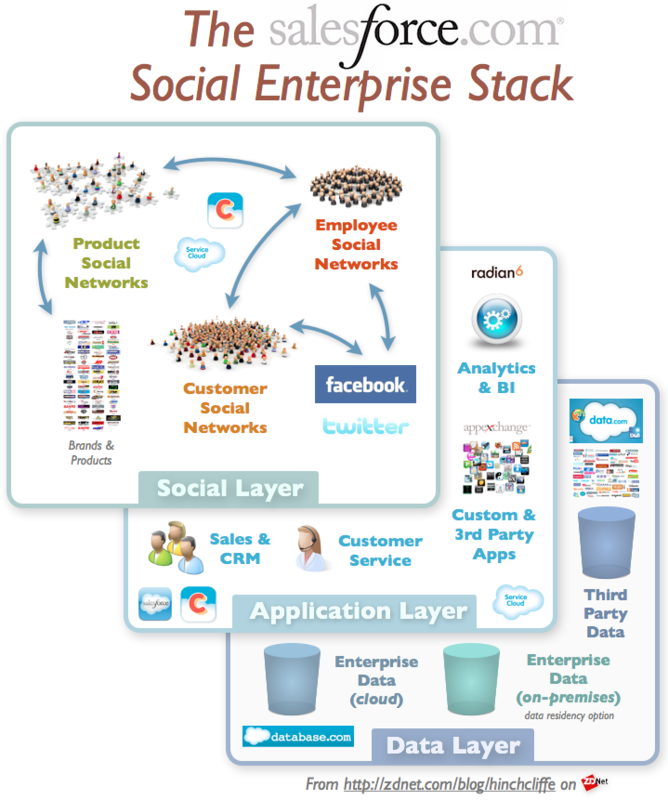 Those that have been engaging in Enterprise 2.0 and Social CRM for the last few years might not agree however, that Salesforce has arrived in social business ‘utopia’ as Larry Dignan skeptically referred to it. Some of the objections have been long-standing with Salesforce: Off-premises SaaS-only hosting, lack of open APIs, no social customer engagement, poor alignment with enterprise needs outside of sales and CRM, immaturity of the social part of the product, and so on. However, most of these objections have been addressed with the announcements yesterday, though it’s also likely that the extensive and complex nature of the product news itself may have obscured this. In fact, as depicted in the social enterprise stack visual above, Salesforce has not only plugged most of the serious holes in the Chatter product, it’s also quickly integrated some of its larger acquisitions, such as social analytics leader Radian6, into a coherent picture with real benefits to customers that use it. Here is what I think the key strengths of the current Salesforce social enterprise vision and stack is, for those organizations traveling down the social business road (as I believe most ultimately will). It’s about the data. The connection of social media and data is one of the most profound, important, and high value relationships, as the world is just beginning to perceive. In a social business, the open participation in thriving, conversational business processes and the sum total of the knowledge flowing inside and outside the business is what the organization is able activate on and create value from. The announcement yesterday of the release ofDatabase.com opens this up a common social data model for organizations to tap into, discovery, and analyze. Database.com is mobile ready and has delivered 36 billion transactions this quarter already according to Salesforce. It also prevents lock-in and integrates all of the social applications in an enterprise. They have also announced the integration of 3rd party data through another service, known as Data.com. This data focus, which is the lifeblood of modern business, shows an awareness of what creates differentiation and value for organizations like few other players in the industry backed with actual products. It’s a full spectrum social business approach that’s aimed at the flow of work. Now that their vision also integrates customers, business partners, as well as employees, the Salesforce social business vision is now much more complete, end-to-end. Though AppExchange has languished in my mind compared to what Apple has accomplished with their app store, it’s nevertheless a source of major 3rd party innovation and business connected workflow. The raft of announcements, such as the new partnership with Workday, with major SaaS vendors here this week shows how integrated Salesforce has become with the next-generation of cloud applications. Combined with the task focused sales and CRM features built into the core platform, this has a much better chance of ensuring the social activity will have a high level positive impact on the business, something that’s been a hot topic of discussion in the Enterprise 2.0 community recently. One of the most complete and mature social platforms. With employee collaboration, customer engagement, and social analytics, combined with an open platform, 3rd party apps ecosystem, and cloud-based hosting, only Jive comes as close to a turnkey solution. The depth of the stack is impressive and the foundation of it has been proven over years of heavy use by businesses. A next-generation vision. It’s safe to say that Salesforce has a very clear vision that is connected as much as they can to ground truth about what businesses are doing and then distilling where they think the world is going to their products. They are making a big investment in time and resources in attempting to understand the strategies, lessons learned, and best practices that businesses can just adopt by using their platform. Access to this insight merely by virtue of using the platform is going to be compelling for many. As much as Salesforce has accomplished in the last year, there are inevitably a few flies in the ointment. Here is where I think the big challenges are going to be. Hosting in the cloud. Even with the new data residency option, many organizations are simply going to demand their social business platforms run inside the enterprise, for security, control, or regulatory reasons. This involves the whole argument about external cloud computing but it’s still a non-starter for many large firms for the foreseeable future. In the end, I think this issue will increasingly fade, unless major stories about companies getting locked-in emerge. It helps that social computing is not (yet) mission critical for most organizations. Early focus on Sales and CRM. Salesforce seemingly cannot abandon the part of the business that built them up in the first place. Yet the platform still exudes a very strong aura of its sales automation roots and this is a distinct turnoff to many parts of the enterprise. To them, using a sales tool for general purpose, enterprise-wide social computing, which it often looks like is happening at first blush, seems like using the wrong tool for the job. This is true especially if the need for social capabilities is outside of sales or CRM. Ultimately, if they are serious about social enterprise, Salesforce may have to change its name and has to truly transform its market focus, the latter being exactly what Oracle did years ago as it moved well beyond databases, without abandoning customers. Fortunately, the latter is happening, we’ll see about the former. Still not enough enterprise sensibility. While many of their partners offer capabilities that large companies need, like LiveOffice’s new compliance capabilities for Chatter, a list of things comes to mind that large organizations will want in their social software: Ready support for enterprise intranet platforms, integration with enterprise search federation, deep connection to content management and document management systems, workflow support, OpenSocial support, are just a few of the top items that IT department and enterprises will want addressed out of the box. This is obviously a tall order and sometimes partners will be an acceptable answer, but in reality — and because of this issue and the ones above — Salesforce often doesn’t resonate well in the CIOs office, though it does much better with the CEO and CMO. To have real success, the platform will need to reach all and speak well to all three key roles in the C-suite. In the final analysis though, I instinctively find the whole picture to be one in which slightly too much control ends up in the hands of Salesforce and not enough to the customer. Those that read my writing know that I’m very bullish on social business and it now seems to be a virtually inevitable transition for most businesses. Is Salesforce the combined platform and business vision that will get them there? I think the answer is yes if you have needs to overlap with the culture, focus, and strengths of the company. The answer is still no if one of the concerns above is true. I do think that they will ultimately remove many if not all of these objections. This will put them perhaps at the top of the list of the world’s pre-eminent social business enablement companies. For now, they are one that most companies will need to consider, even if it’s just to learn what they know about social business.